Each habit appears once a week, giving you a year to practice and make them all a part of your daily life. Learn why the habits are important, discover tips based on the latest research about making positive change, and explore simple exercises for building new routines. Improve yourself and make a difference in the world with journaling prompts and generous acts. 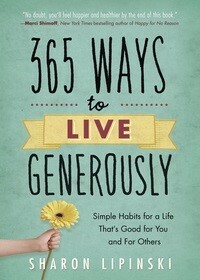 Using this inspiring book, you'll develop the habits needed to create a life that's good for you and others. The Family Doesn’t Want to Change, Part 1; The Meditation Habit; The Risks of Not Connecting; Negative Self-Talk; Simple Pleasures; Money Can Buy Happiness; It’s Working! One Habit at a Time; Where Should You Meditate? ; Good for You and Good for Others; Forgive Yourself, Step 1; Gratitude Letter; Discover Something Unusual; How Much Should I Donate? Energy for life; Mindful Eating; Cluster Giving; Be Proud; Stormy Waters; Memories; How Do You Feel about Money? How to Visualize Success, Part 1; Saying Grace; What You’ve Meant to Me; Have Some Fun; Work Gratitude; Busyness; Should I Start My Own Charity?